Sri bhavani mega township - Villa Plots near I.T.PARK,AIRPORT Road. 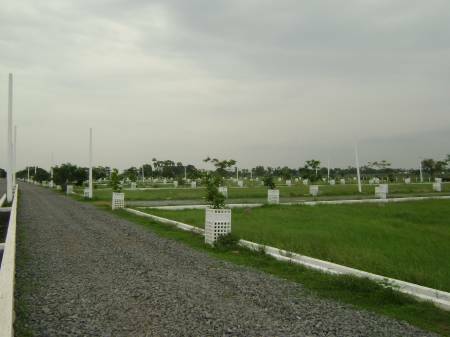 A beautiful gated community of 1000 villa plots spread across 70 acres of land. Located just 2K.m from NH5 and L&T I.T PARK, AIRPORT 6 Lines Road. City center just 11 kms from ramavarapadu ring. Sri Bhavani Mega Township you the opportunity to build your dream home at a location that's close enough to the city, yet extremely affordable. Sri Bhavani mega township plots are fitted out with all the necessary infrastructural facilities and are completely construction ready. All that remains to build your homestead is your imagination. Of course, living in the lap of nature need not mean being cut off from the city. Sri Bhavani Mega Township is just 2 K.M off NH-5 besides 4 lines gannvaram to kankipadu road. As it is just 2kms from ITPARK and AIRPORT the land will be appreciated with all the amenities includes hospital, fire service, post office, public gardens etc around Sri Bhavani Mega Township which is the Appreciation factor for the Present Investment. While Bhavani mega township villa Plots are extremely affordable to begin with, what makes them even more attractive is the fact that you can easily get a loan to purchase your Plot from leading financial institutions. In other words, owning your dream villa at Bhavani Mega Township has never been this easier. Get in touch with our representatives now. * 45% open space, landscaped gardens, and tree-lined avenues. * Box type storm water drains. I was greatly impressed to see the good work.Thanks For shearing. It's just incredibly valuable information for me. Thank you for sharing it with us. this villa can be a dream of everybody, I suppose :) thanks for this information! To be honest, you would better follow this link and see how resume-service.org helps to avoid popular cover letter mistakes It's free of charge! Do not worry!